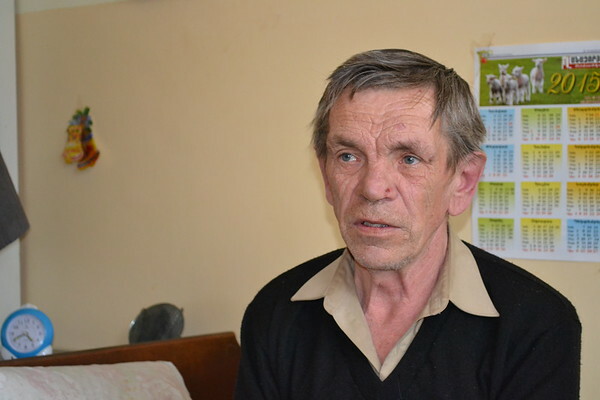 Aleksandr Nersesyan, 67, is known as “Roman” to everyone at FAR’s Vanadzor Old Age Home* (VOAH). He moved to VOAH six years ago following a trying foot amputation. Throughout the years, he managed to overcome his post-surgery stress by once again finding joy in painting and music, all thanks to the continuous support of VOAH’s staff and its residents. Roman was born in the town of Stepanavan, in Lori Province, and moved to Yerevan with his family at the age of five. He earned his nickname from his mother, who started calling him that after the death of his brother, Roman. He studied painting at university and returned to his hometown to teach right after graduation in the early 1970s. Eventually, the collapse of the Soviet Union changed his path, just as it did for many at the time. Roman changed jobs several times over the years, at one point working in a milk processing factory, and at another time as a bus driver. He was also unemployed for a long period due to various health issues; problems with his blood vessels culminated in his foot amputation. While the surgery harmed his attitude toward life, Roman didn’t lose all hope. VOAH has helped with that. At VOAH, Roman loves to keep himself busy with painting and wood carving while listening to the music of Armenian composers. He has painted nearly everyone’s portraits at the home, and mostly likes to carves churches out of wood. “A person should treat everyone well—his friends, neighbors, relatives, and even strangers. One should strive to do nothing but good, never bad. This is the only true way to stay human,” said Roman. He feels really home at VOAH and describes it as a secure and decent place to live. “We are surrounded by love—ask anyone!” he said. Yet, Roman still harbors a dream: to one day visit the museums of Paris. *The Vanadzor Old Age Home (VOAH) is a FAR project sponsored by the Kevork and Sirvart Karamanuk Foundation and supported by the Women’s Guild Central Council of the Diocese of the Armenian Church of America (Eastern).